New Changes: Now JEE Main is conducted by National Testing Agency Insist of CBSE. The candidate who is desirous of getting admission to prestigious engineering colleges in India needs to be aware of Changes JEE Main 2019 & JEE Advanced 2019. IIT JEE Main and IIT JEE Advanced are two of the most illustrious entrance exams in India. 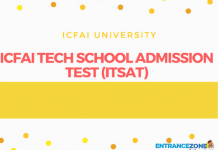 Admission to upper echelon colleges such as IIT’s, NIT’s, IIIT’s, etc. is through these two examinations. The Main exam will be conducted twice in a year, first in January and second in April 2019, whereas JEE Advanced 2019 will take place on 20 May 2019. Also, around 13 Lakhs aspirants appear for the JEE Main Entrance Exam and out of these only 2.24 Lakhs Students will qualify for JEE Advanced. 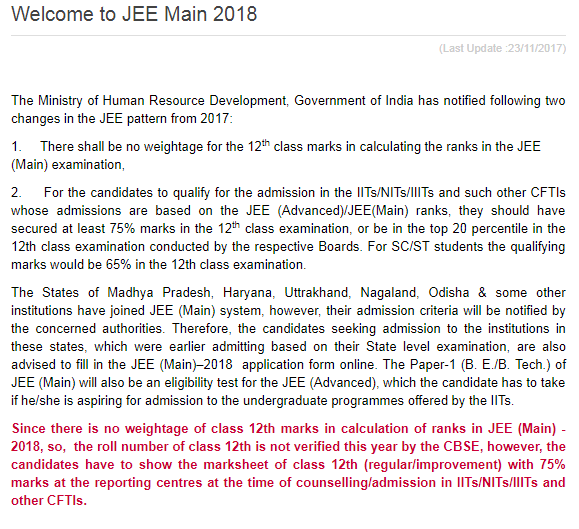 Therefore, candidates can see the Changes in JEE Main 2019 and JEE Advanced 2019 in the article below. Latest Update: JEE Main(II) 2019 Application Form released. Click here> Application Form. Check your JEE Main Rank Prediction Here. The New changes according to National Testing Agency Will be updated soon. Following are the changes in JEE Main 2019 & JEE Advanced 2019 eligibility criteria. 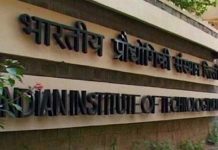 Please read these changes for admission into the Indian Institute of Technology (IITs). Aadhar is not mandatory document for JEE Main Exam registration. Age Limit: There is no age limit to appear in the examination. No weightage of Class 12th Marks. No weightage to the performance of the candidate in the (10+2) or equivalent qualifying examinations. Candidate will have to get a minimum percentage to qualify for JEE Mains. Candidates will have to be in score 75% marks in the qualifying examination or be in the top 20 percentile in their board in order to be eligible for appearing in JEE Main 2019. Earlier, there was 40% weightage of marks scored in boards and 60% weightage of performance in Joint Entrance Examination (Main). Seats for girl students are increased from 8% to 14%. Candidates who belong to SC/ Category will have to score a minimum aggregate of 65% in boards or be in the top 20 percentile. A total of 2.24 Lakhs Aspirants will qualify for writing JEE Advanced. Last year, 2 Lakhs students qualified for writing JEE Advanced (2019). Type of questions: As per new format type of questions will be more descriptive. Category-wise distribution of the above mentioned 2.2 Lakhs students is given below. 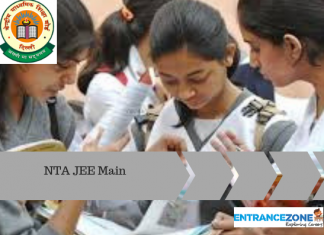 Candidates can see the other details regarding JEE Main 2019 and JEE Advanced 2019 on our website EntranceZone. Aadhar is not compulsory for registration in JEE Main & Advanced 2019. Conducting body for JEE Main: National Testing Agency. Conducting body for JEE Advanced: IIT Roorkee. Test Mode: Computer-based & Pen & Paper. Level of exam: National level. Admission Board: Joint Admission Board (JAB), JoSAA, CSAB. 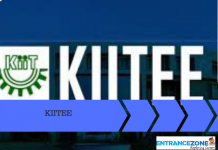 iit pattern changes latest news 2019, who will conduct jee main 2019, news related to jee main 2019, jee advanced 2019 subjective, jee main changes. All the information that I was looking for! 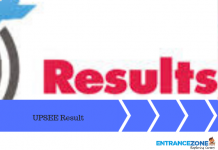 How can I stay updated with JEE ADVANCE NEWS? How to apply for the online exam mode? What are the recent updates? When we will get the updates?